Yoohoo!! Today I am writing my 100th post on my blog. I still can't believe that this post is my 100th one on this blog. One whole year , so much of learning, experimenting, cooking and of course eating ;) . As Confucius has quoted "Choose a job you love, and you will never have to work a day in your life", With this blog I can claim that yes when you love something or enjoy doing it every time you don't feel like you are doing any work at all. It automatically becomes a part of you and your soul just like breathing. 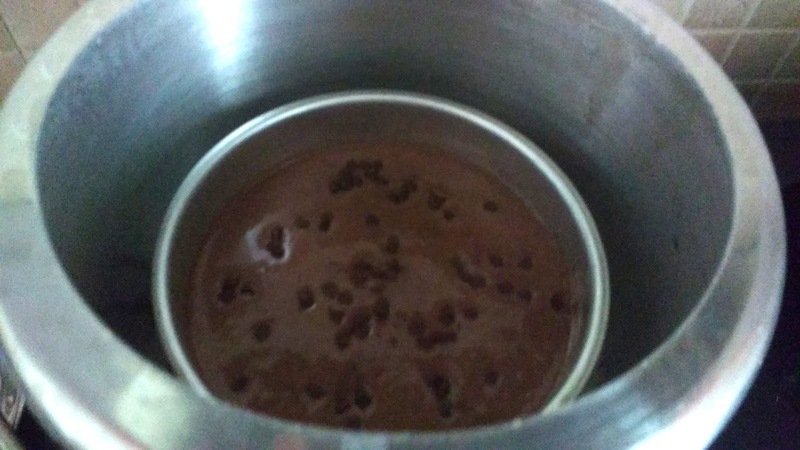 Ab itna achcha mauka hai, to kuch meetha to banta hai na :D. As I am a big time chocolate lover, it has to be one of the ingredients in today's recipe. 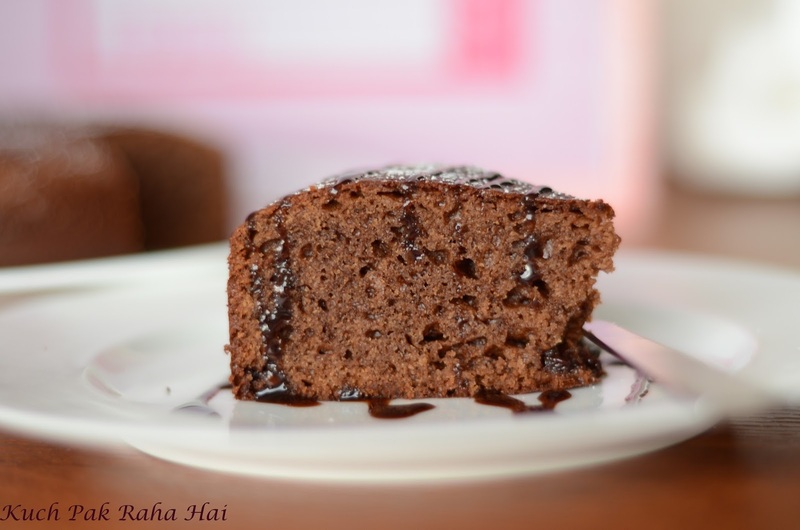 So here I am sharing the recipe of "Eggless Chocolate cake" made in Pressure cooker. 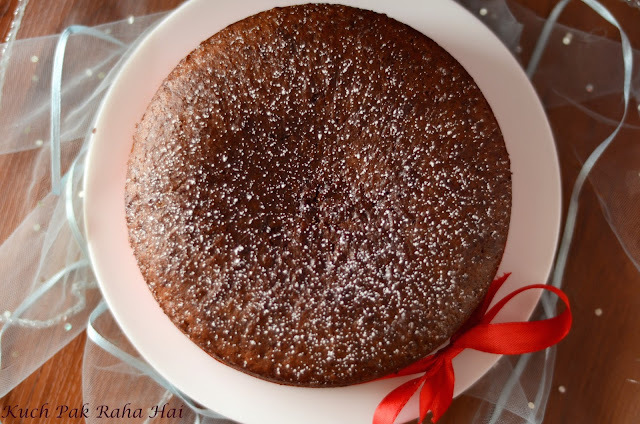 This recipe is a gift to all my blog readers, family or friends who have supported, encouraged and appreciated my work so much in the past one year. The cake has already been shared and celebrated with family and friends but all that I can share with my readers/followers is my love, gratitude, happiness and of course this soft, moist and delicious chocolate cake recipe. 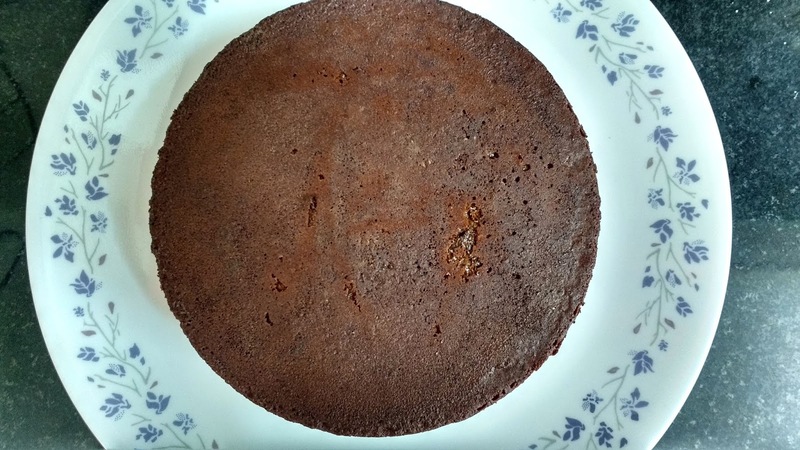 After I posted the recipe of Eggless tutti fruity cake (which has now also become top visited recipe of this blog), I got innumerable request for a cake recipe that can be made without oven. 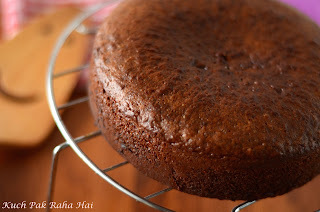 At that time I realised that there are many home-cooks who would love to do baking and make cake for their loved ones but are unable to do so because they don't have ovens or they do not know how to operate the convection oven correctly. Using this recipe, they can bake perfect cakes in pressure cooker. 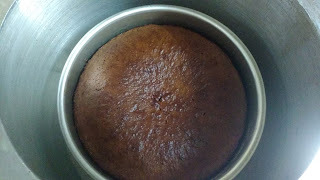 This recipe can be made in oven also. 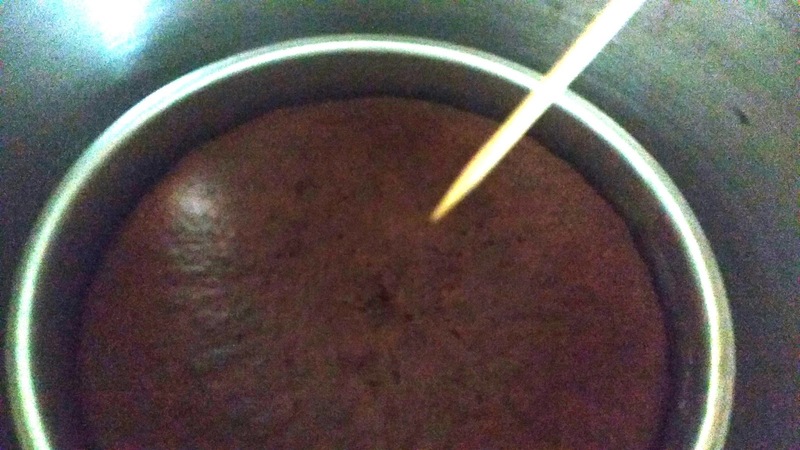 Take Milkmaid (buy here) and sugar in a mixing bowl. 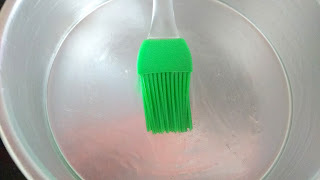 Whisk well till it is light and fluffy. Keep it aside. This is the Preheating step.Take 4 cups of salt in a pressure cooker. Cover the lid without the vent valve. Let it heat on medium flame for ten minutes. In the mean while, you can proceed to next step. 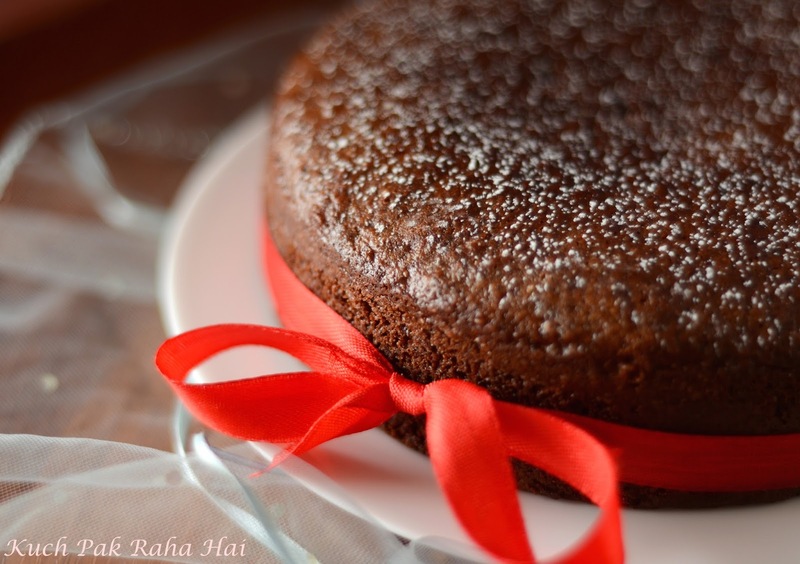 If you are baking in oven, set it to preheat at 180 degrees Celsius. Sieve together Maida, Cocoa powder(buy here), baking powder, baking soda and salt. These are the dry ingredients of the recipe. Keep it aside. 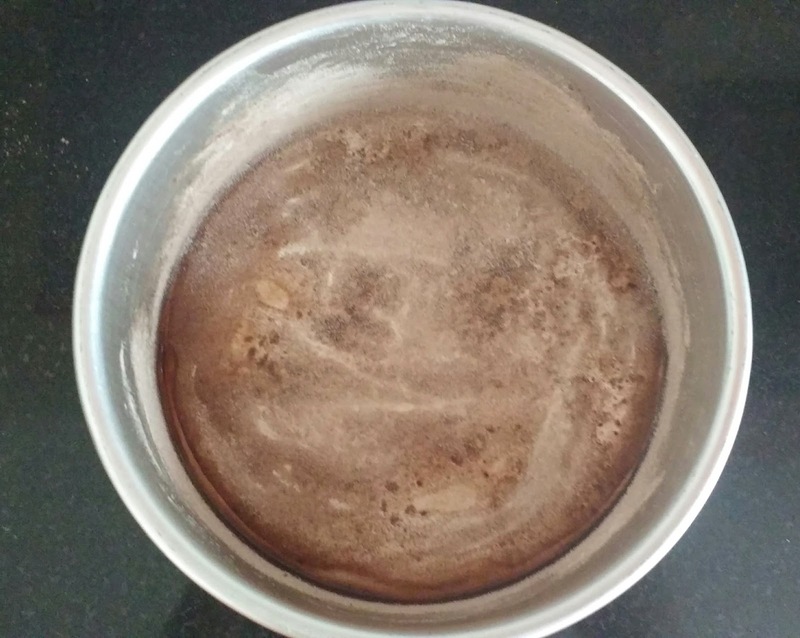 Grease the insides of baking tin using a tablespoon of refine oil. You can use your hands or a silicon brush (buy here). 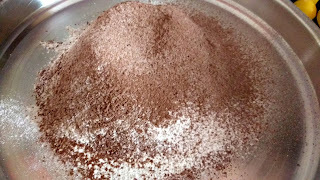 Mix together Maida and cocoa powder (for lining the tin) and sprinkle on the base of tin. Gently tilt with a tapping motion on the walls of tin in order to coat the APF/Cocoa powder on the base and walls of tin. 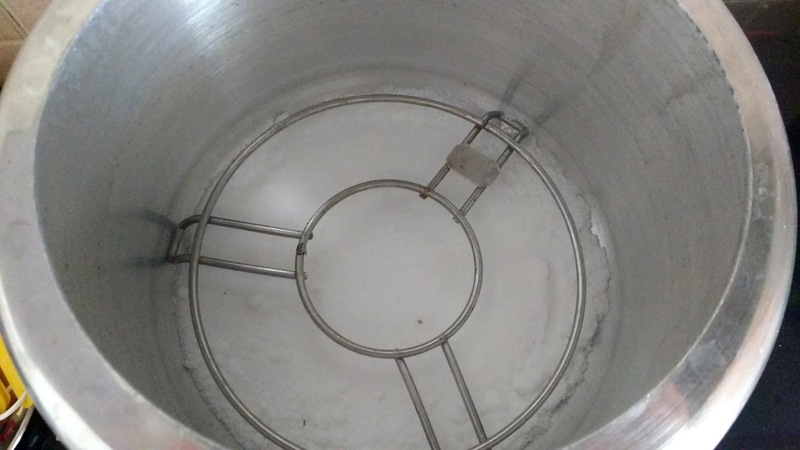 Add vanilla essence to the whisked milkmaid. Start folding the dry ingredients into it gently portion by portion. Do not add all the dry ingredients in one step. Add milk and refined oil also tablespoon by tablespoon while folding. 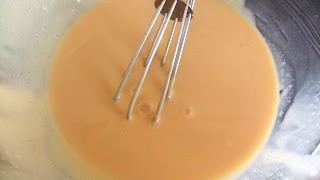 Mix till the batter start falling in ribbons. Do not mix too much or take too long at this step. The batter should not be very thick or runny. 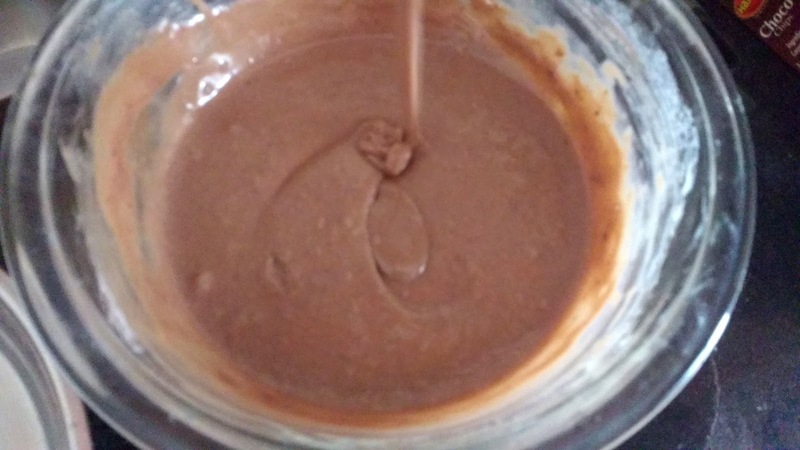 Pour this batter inside the lined baking tin. 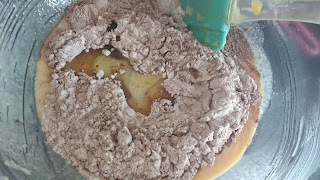 You can sprinkle some nuts or chocolate chips on the top also but it is totally optional.Your cooker must have been ready by this time. Open its lid carefully. Place a stand and then cake tin over it. Let the cake cook on low flame. Check it using a toothpick after 25 minutes. If it comes out clean , then the cake is ready else keep it for another 2-4 minutes depending on how wet the mixture on toothpick is. If you are baking it in oven, bake it at 180 degree for 25-30 minutes. 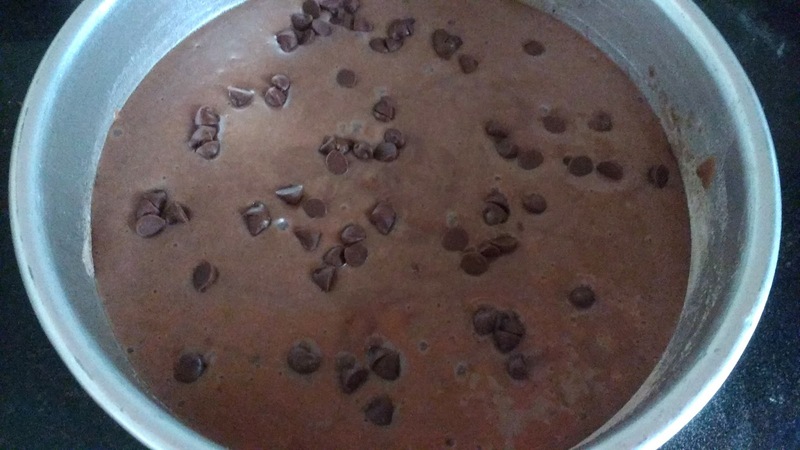 Once done, bring the tin out of cooker, let it cool down for 10-15 minutes. 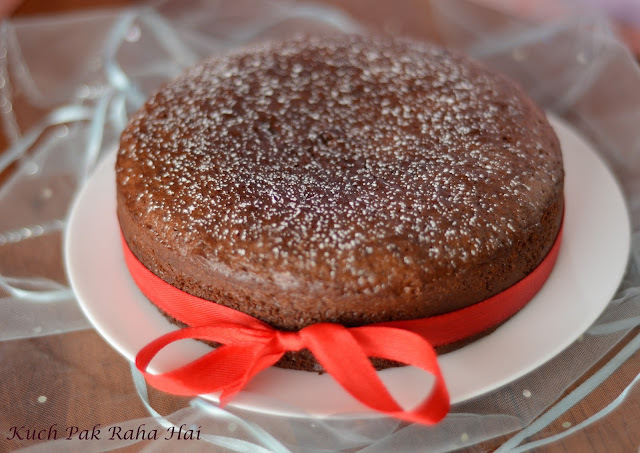 Move the knife along the edges of the cake (i.e. between cake boundary and cake tin). Invert it over a plate. 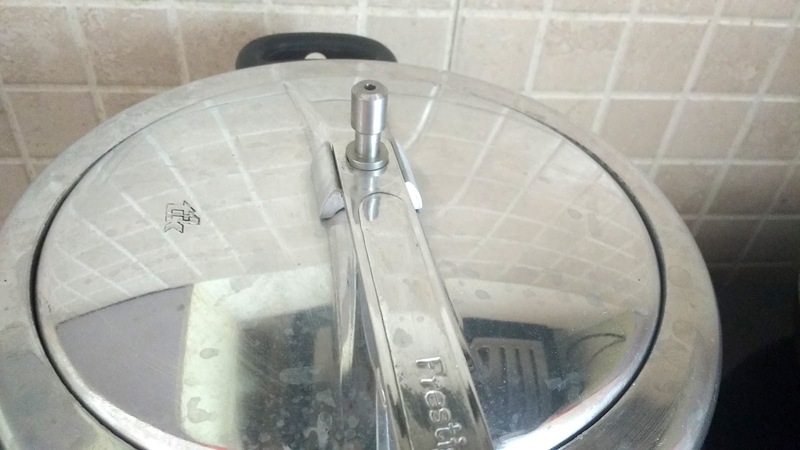 You may need to tap gently the back of cake tin. Place the cake over a wire rack for cooling down. 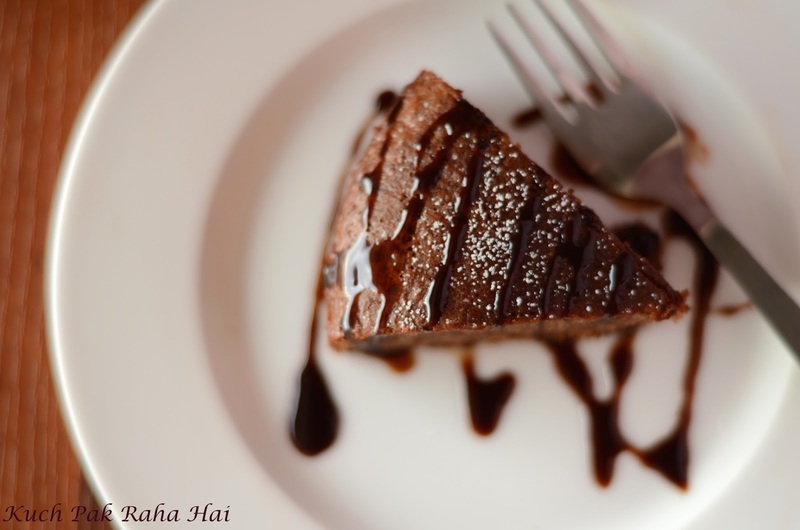 Slice and enjoy soft, fluffy and delicious chocolate cake. You can pour your favourite chocolate syrup or dust some powdered sugar over it for that lovely snowy effect!! any chance we can make dhokla this way? Yes keep the gasket. Remove only the whistle. Hi divya. 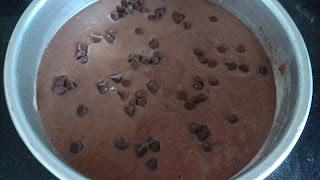 .could u please tell how many litres cooker is advisable for this recipe & can I use steel cooker? 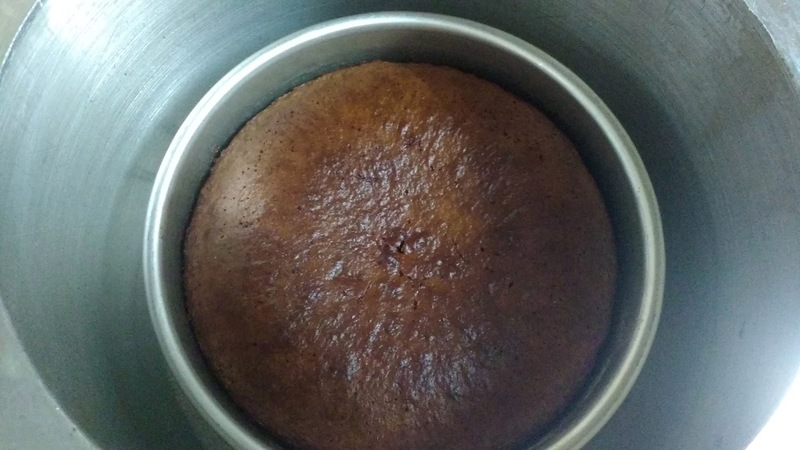 Hello, I have used 5 litres capacity cooker for a cake tin of size 6.5 inches. I am not sure about the steel one. I have used an aluminium cooker here, you can even use hard anodised cooker.